For three hundred years, Blenheim Palace, seat of the Dukes of Marlborough, has awed all visitors, even the grandest among them. “We have nothing to equal this,” King George III said with a gasp to Queen Charlotte in 1786 as they caught their first glimpse of the Baroque behemoth, in Oxfordshire. 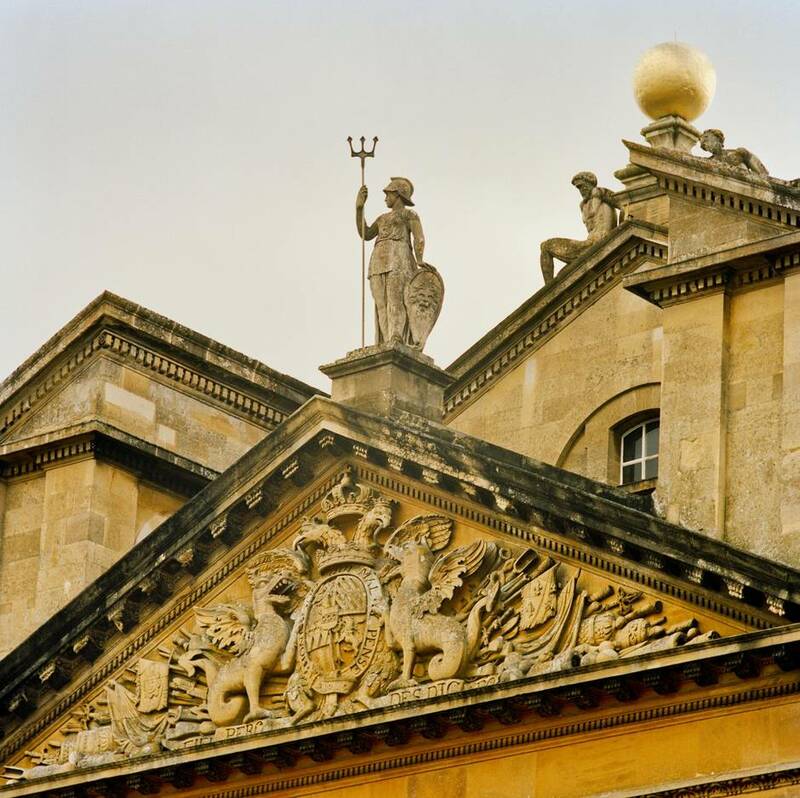 The palace’s cornerstone was laid in June, 1705, less than a year after the 1st Duke of Marlborough’s pivotal victory against the French on the fields of Blenheim, in Bavaria. On behalf of “a grateful nation,” Queen Anne granted Marlborough and his heirs the two-thousand-acre royal manor of Woodstock, and Parliament voted to provide funds to build on it a suitably magnificent structure. The problem was nobody thought to set a budget. To make a very long story very short, costs to build what was to be not just a home but a national monument had skyrocketed to £240,000 by 1711 (from the duke’s initial guesstimate of £40,000), leading Parliament to cut off all funds. Meanwhile, political intrigue prompted Queen Anne to dismiss the duke and duchess from court, sending them into self-imposed exile abroad for two years. Construction halted and did not recommence until 1716, now completely on the duke’s dime. Over the next few years he poured in £60,000, even as he and his formidable duchess argued vehemently over aesthetic decisions – between themselves as well as with their long-suffering architect, Sir John Vanbrugh, who finally stormed off in a rage, leaving Nicholas Hawksmoor to keep things going (though the project was not completed until around 1733, eleven years after the duke’s death). Its maintenance has been an albatross for every succeeding generation of the family. As a consequence, the Dukes of Marlborough have sometimes had to make sacrifices. On occasion that has meant marrying for money, not love – the most famous example being the 1895 union of the 9th Duke and Consuelo Vanderbilt, the poster heiress of the Gilded Age. It was the ultimate “cash for class” deal. Consuelo’s socially ravenous mother, Alva, craved a duchess’s coronet for her family, while his family sought the $2.5-million dowry she would bring (about $66-million in today’s money). Consuelo, thanks to the fortune she brought, has often been seen as the saviour of Blenheim. But arguably no one ever did more to safeguard the estate than His Grace the 11th Duke of Marlborough, John George Vanderbilt Henry Spencer-Churchill, who died in 2014 at the age of 88. Over the course of his forty-two-year dukedom, he left an indelible mark on Blenheim, as well as on British society. Tall and gruff, with his aristocratic mumble, the duke was a Wodehousian relic. If one adjective had been used over the years to describe him, it was grumpy. Which is deliciously ironic, given his nickname, Sunny – coined certainly not thanks to his disposition but after one of his courtesy titles, the Earl of Sunderland. With its 187 rooms, Blenheim was one of the first “great houses” of England to open its staterooms to visits from the paying public. By the late eighteenth century, crowds were turning up to gawk at the 64-foot-high marble Great Hall, the 180-foot-long Long Library, and the palace’s other colossally scaled rooms. “Everything’s open except my loo!” barked Sunny jokingly, during an interview in 2011. In fact, plenty has remained private, notably the east wing, where the family lives – a 46-room, four-storey block with twelve bedrooms and ten bathrooms. A staff of 158, many of whom have been there for decades, still runs the estate by standards rarely seen today outside of Masterpiece Theatre. Overnight guests get to their rooms to find the contents of the luggage taken by the under butler at the front door pressed and hanging in wardrobes or neatly folded in dresser drawers, while their shoes have been shined to a gleam. (Before departure their items are meticulously packed.) In the morning, a housekeeper or valet comes to draw the curtains and serve coffee, as well as, for ladies, the option of breakfast in bed. At 8:30 a.m., male guests were expected to join His Grace in the dining room, where copies of the Racing Post and all the London dailies also await. And while they are not used as they formerly were, the fifty-some “house bells” in the servants’ hall, connecting to most of the major rooms, can still function. “Now we have this small area,” he said, almost apologetically. “But it’s quite warm and cozy, and quite effective as a family home,” he added, seated in the Smoking Room. Indeed it is. Pictures by George Stubbs and John Wootton hang on silk-lined walls, and a fire crackled while a butler brought in tea, and Jerry, a four-year-old yellow Lab, romped around. He did not deny that Blenheim is a burden to maintain. “Yes, but it’s a labour of love and I adore it,” he insisted. “All my life I have tried to assure its future, and ensure that it remains unique in the annals of British history. 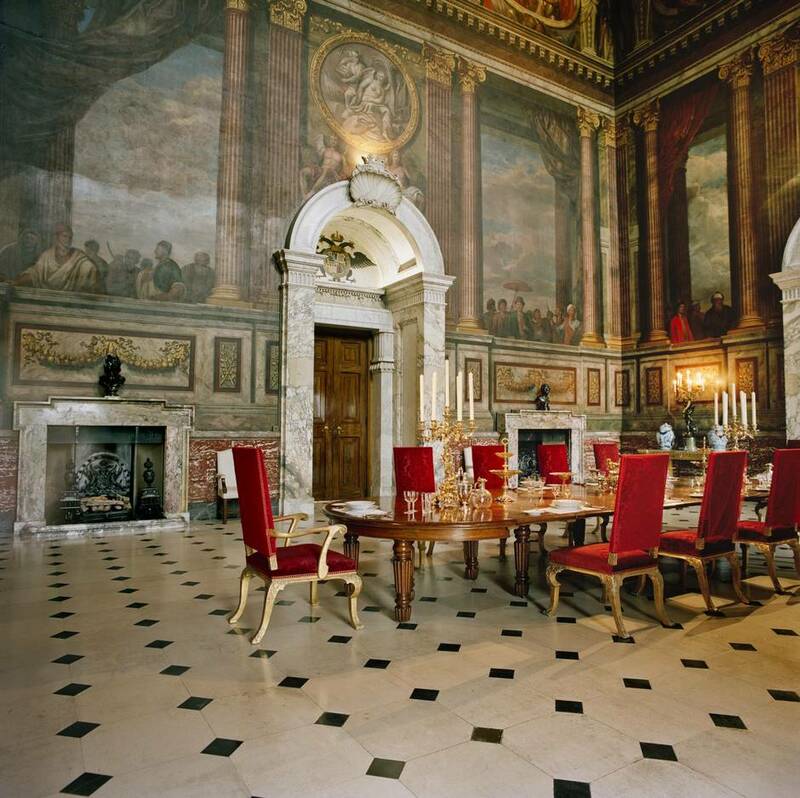 My famous ancestor won the Battle of Blenheim in one day – but his descendants have been fighting it ever since.” To wit, repainting the interiors took seven years, and rewiring took another seven years. In 2009, he had to spend a million pounds to rebuild the Blenheim Dam and its adjoining cascade, created by (Capability) Brown, to comply with a law requiring that such structures be able to withstand a one-in-ten-thousand-year flood. “You never know when something unsuspected will turn up,” he said. In October, 2014, following his father’s sudden death from a heart attack, [eldest son Jamie] became the 12th Duke of Marlborough. With this succession, a new era has come to Blenheim. 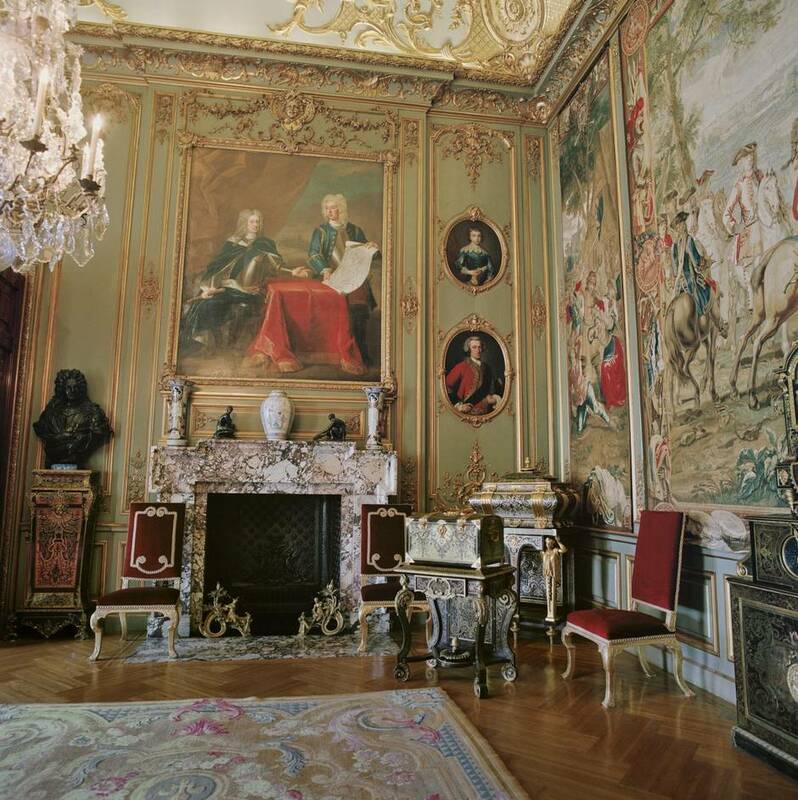 The 12th Duke has opened up more doors to the public than ever – with tours of the family’s private apartments as well as of “downstairs,” where visitors can see areas used by household staff both past and present. Meanwhile, the duke’s younger brother, Edward, established the Blenheim Art Foundation, which has commissioned contemporary artists such as Ai Weiwei and Lawrence Weiner to install their provocative works inside the palace. According to Lord Edward, the goal of the foundation is to prevent the place from petrifying. 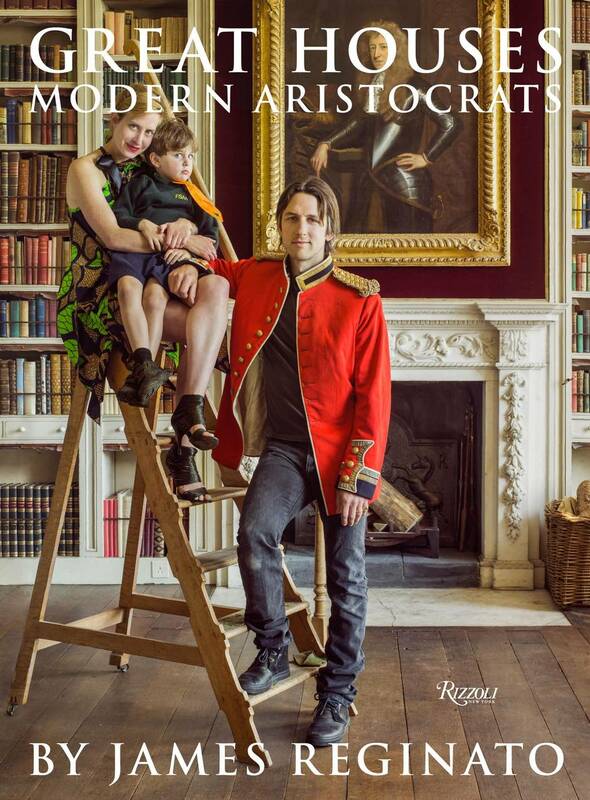 Excerpted with permission from © Great Houses, Modern Aristocrats by James Reginato, Rizzoli New York, 2016.